DETROIT December 18, 2013 -- Thom Connors, regional vice president and general manager of SMG/Cobo Center, announced today that Cobo Center’s adaptive re-use renovation of the former Cobo Arena into a 40,000 square-foot ballroom, 30,000 square foot, glass enclosed, three story atrium and 10,000 square-feet of pre-function space overlooking the Detroit river, generated one million dollars in revenue in the first months of operation. Included in that million-dollar revenue figure is $800,000 generated by food and beverage sales for banquets, meetings, fundraisers, conferences and tribute events hosted in the ballroom. 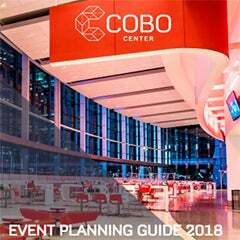 "We are extraordinarily proud to welcome guests to this remarkable facility, and to extend unique and high-quality hospitality reflective of the city's spirit," said Jason Hougard, General Manager of Centerplate, the exclusive food and beverage partner to Cobo Center. Recent events in the Grand Riverview Ballroom and adjacent spaces include: the Detroit Riverfront Conservancy’s Shimmer on the River; Detroit Economic Club and Inforum Luncheons; Goodfellow’s Breakfast; Cattle Barron’s Ball; Henry Ford Health System’s Night of Stars; Crain’s Detroit Business, SoundBiz Conference; The Benefit, A Celebration to Beat NF; KMPG’s Holiday Party, the Dennis Archer Service Awards, hosted by the MI Bar Association; and the Mayor Bing Tribute Celebration, on December 18. 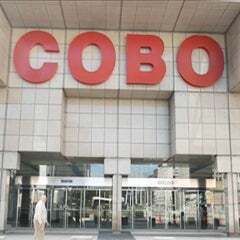 Conferences alone since the September 7 opening of the new spaces brought almost 100,000 attendees into Cobo Center. 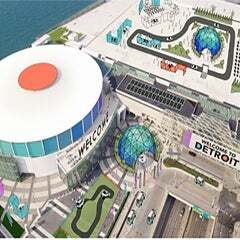 Among these are: Detroit Chamber’s MichAuto; TedX Detroit; Michigan Charter Schools Conference; PricewaterhouseCoopers Talent Transformation Conference; and the National Alliance of Black School Educators.